It's time! Black Friday Savings are now live on TFAW and you can save 50% on thousands of in-stock products. The Black Friday Sale will get better and better all week with the discount increasing to 60% on 11/24, and DOZENS of Black Friday Doorbusters added on 11/27, so don't miss out on your chance to grab some great savings! 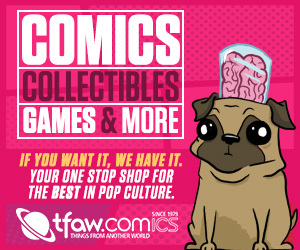 All the hottest new comics, graphic novels, toys, statues, and more are listed below!